← Taking the train downtown part 2 – will we be sitting or standing, and why? The NSW state government has finally ended years of speculation by announcing that a metro will be built between Parramatta and the CBD to increase capacity and reduce overcrowding in this corridor. Dubbed Sydney Metro West, the project is expected to be opened in the “second half of the 2030s”. The announcement comes barely two weeks after the closing date for comments on the government’s Western Sydney Rail Needs Scoping Study in which a “western metro-style service” and a “new higher speed tunnel” were two of the five options nominated to connect Western Sydney with other parts of Sydney, along with six options that connected to the proposed Western Sydney Airport. While Monday’s announcement confirms that the government has committed to the construction of the metro and provided some indications of its preferred route, it leaves many fundamental questions about the project unanswered. We can however make some guesses about what shape the new line might take. While the initial Sydney Metro Northwest and City and Southwest announcements were not exactly over-burdened with documentation, the Metro West announcement by the NSW Premier Mike Baird and the Minister for Transport and Infrastructure Andrew Constance was far briefer, both in form and content. Comprising a media release, single website page, a two-page project overview, a short promotional video and little else, the announcement contained no information on fundamental issues such as the specific route, number of stations, projected travel times and patronage or the potential for further extensions. The announcement does states that the project “will provide a direct connection between the CBDs of Parramatta and Sydney, serving growing communities along the route and a booming region for generations to come”. The announcement claims the project will double rail capacity between Parramatta and the CBD by being able to move about 40,000 people an hour in each direction. The announcement also says the project will be built largely underground with stations at Sydney Olympic Park and the Bays Precinct as well as in Parramatta and the CBD. The government will also investigate “innovative ways to reduce travel times between the two CBDs as well as the final number of stations needed to service communities along the route”, with other potential stations along the route to be determined through industry and community consultations. The project appears also to be based on Option A in the scoping study mentioned earlier for a new western metro-style service, though it may also draw on elements of option E, the higher speed tunnel between Parramatta and the CBD with its emphasis on reducing travel times. Media reports also indicate that the Premier and Minister suggested that the line will be run single-deck driverless trains similar to those planned for the metro line currently under construction. Contrary to earlier media reports, the planned Western Sydney light rail line from Westmead and Parramatta to Strathfield via Olympic Park will not be affected; instead the metro will dovetail with the light rail. “Light rail is about connecting precincts – this project is obviously a mass-transit solution which is going to lead to connectivity between Parramatta and the CBD,” Minister Andrew Constance is quoted as saying. There were no detailed costings released at the media conference, though the Premier said the $16 billion Ausgrid electricity infrastructure leasing deal had allowed the government to bring forward planning for the project. Media reports suggest that it will cost around $10 billion. While the government’s announcement has provided only the bare bones of the project, it is possible to put some flesh on it, based on what we have seen in the planning and implementation of the metro initiatives currently under construction and making some assumptions about the likely route and station locations. 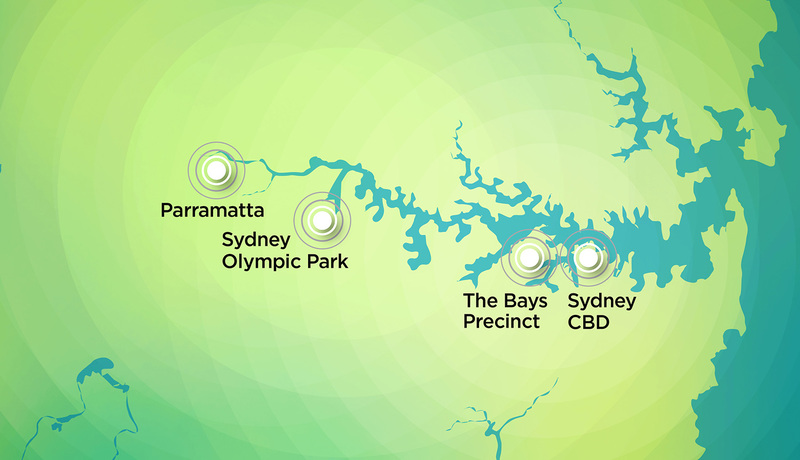 I’ll start by looking at the options for stations in the four identified precincts committed to in the announcement – Sydney CBD, the Bays Precinct, Sydney Olympic Park and Parramatta. No indication is given of where the CBD terminal will be, though the project overview indicates that it will allow “easy access to the existing public transport network and Stages 1 and 2 of Sydney Metro”. Only two existing CBD stations, Martin Place and Central, will provide direct interchange between the existing rail network and the metro currently under construction. Given Central’s location on the fringe of the CBD, this leaves Martin Place as the most likely candidate. It is possible however that the CBD end of the line could be served by two or more stations. In this scenario one station could provide metro-to-metro interchange while the other could link the West Metro to the existing rail system. This would allow interchange options such as, for example, Barangaroo and Wynyard or Pitt Street and Central. There is one other possibility. The current metro project will have much greater capacity than the likely demand, especially south of the CBD, and so in theory the metro west line could be integrated into it directly as a branch line south of Central Station. It is likely however that the west metro will require more services than the surplus capacity the city and southwest metro could provide, so it will require its own CBD tunnels and terminus (options for extensions east or southeast of the CBD will be discussed in the next post).. Depending on where the station is located, it would offer the potential to deal with one of the most significant criticisms of the Bays project – the lack of an adequate public transport strategy to support the area’s growth. However given the linear nature of the project with 5.5 km of waterfront involved it is difficult to see how a single station could service the whole site unless it is linked with a local distribution system such as an extension of the inner west light rail line which already services part of the site. Apart from the potential to service development in its own right, the metro offers the opportunity to grow Sydney Olympic Park into a major transport interchange. A lot however will depend both on the locations selected for both the metro and light rail stops and whether they will constructed close to each other and the existing heavy rail terminal, but integration with the light rail at least appears to be highly likely given the decision to keep the latter. Parramatta is also likely to be a key interchange to the heavy rail network, offering passengers on the western line an easy interchange to the metro. It also understood that the reconstruction of the station completed a decade ago incorporated the capacity to deal with further expansion based on the assumption that the abandoned project to link Epping to Parramatta link might one day be revived. In my next post I’ll move further into speculation by looking at the options for the route and for future extensions. This entry was posted in Infrastructure, Public Transport, Sydney metro area, Transport, Western Sydney and tagged Infrastructure, light rail, metro, NWRL, Rail, Strategic Planning, Sydney metro area, Transport. Bookmark the permalink.